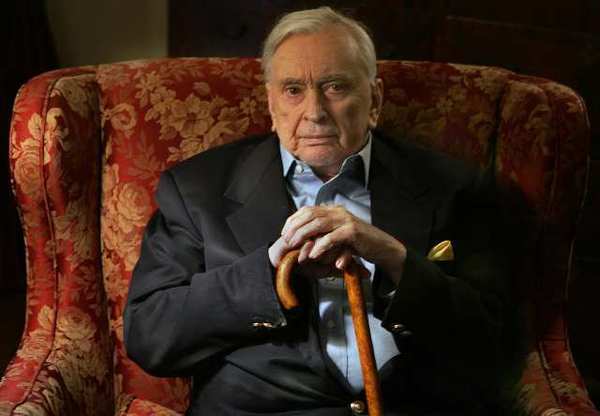 Celebrated author and political commentator Gore Vidal has died aged 86, his family has confirmed. Gore Vidal, born Eugene Luther Gore Vidal, died at his home in Los Angeles on Tuesday evening, with the cause of death believed to be complications from pneumonia. Gore Vidal produced 25 novels, including the best-selling Burr and Myra Breckenridge, more than 200 essays and several plays. The author also ran for political office twice and was a well-known commentator. His nephew Burr Steers told US media that his uncle had been ill “for quite a while”. Gore Vidal was among a generation of literary writers who were also genuine celebrities – fixtures on chat shows and in gossip columns. His social circle included Tennessee Williams, Orson Welles, Truman Capote and Frank Sinatra. Gore Vidal wrote his first book aged 19 and later went on to become one of America’s most distinguished authors. But he was not always comfortable with the literary and political establishment. His second book, the City and the Pillar, tackled homosexuality, making it highly controversial at the time. Bookshops refused to stock it, and he was ostracized for most of the 1950s and forced to work under pseudonyms. In the late 1950s he began to write under his own name again, working on the screenplay to Ben Hur, among other films. Born in 1925, Eugene Luther Gore Vidal was the scion of one of America’s grandest political dynasties. His grandfather, TP Gore, was a senator and his father a one-time Secretary of Aviation under President Franklin D. Roosevelt.